Bethlehem sits on a hill and is now surrounded by an Israeli security wall. Still, it is possible to see the little town of which we all sing at Christmas time. It seems Bethlehem as often been a place that attracts strong walls. 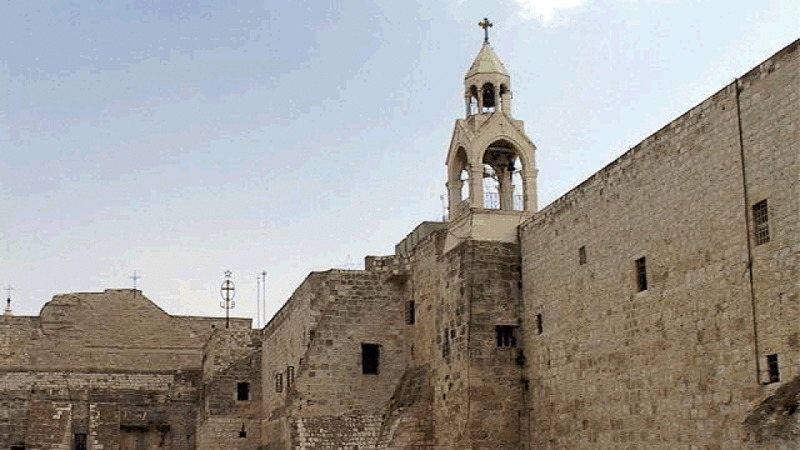 The walls of the Church of the Nativity, a Crusader style building, look as though they could repel an army. The church was not built for beauty but for strength. Beneath the altar is a cave where it is believed Jesus was born. Now adorned with decorative wall covering and decorations befitting a prince, the cave is hardly recognizable as the stable we all grew up imagining. But it was here (or a place near here), that Jesus was born. 16: And they journeyed from Bethel; and there was but a little way to come to Ephrath: and Rachel travailed, and she had hard labour. 17: And it came to pass, when she was in hard labour, that the midwife said unto her, Fear not; thou shalt have this son also. 18: And it came to pass, as her soul was in departing, (for she died) that she called his name Ben-oni: but his father called him Benjamin. 1: And it came to pass after these things, that one told Joseph, Behold, thy father is sick: and he took with him his two sons, Manasseh and Ephraim. 2: And one told Jacob, and said, Behold, thy son Joseph cometh unto thee: and Israel strengthened himself, and sat upon the bed. 5: And now thy two sons, Ephraim and Manasseh, which were born unto thee in the land of Egypt before I came unto thee into Egypt, are mine; as Reuben and Simeon, they shall be mine. 6: And thy issue, which thou begettest after them, shall be thine, and shall be called after the name of their brethren in their inheritance. 7: And as for me, when I came from Padan, Rachel died by me in the land of Canaan in the way, when yet there was but a little way to come unto Ephrath: and I buried her there in the way of Ephrath; the same is Bethlehem. 12: Now David was the son of that Ephrathite of Beth-lehem-judah, whose name was Jesse; and he had eight sons: and the man went among men for an old man in the days of Saul. The incarnation of Christ on earth is a fulfillment of all of the Old Testament prophecies and promises (see 2 Corinthians passage) starting with Genesis 3:15 through many more, of which only a few related to his birth and its timing, are listed below. 1: Behold, I will send my messenger, and he shall prepare the way before me: and the Lord, whom ye seek, shall suddenly come to this temple, even the messenger of the covenant, whom ye delight in: behold, he shall come, saith the LORD of hosts.